Managed by Joseph R. Huber, this equity income mutual fund is ranked with 5 stars rating. Its total net assets are only $67.1 million. There is no sales load for this investor class fund. Its expense ratio fee is 1.49%. This Huber Capital Equity Income Fund utilizes its assets to purchase undervalued large cap U.S. companies. The fund’s dividend yield is 0.67%. In 2103, it has a year-to-date return of 37.21%. This best performing equity income mutual fund has returned 17.67% over the past 3 years, and 24.85% over the past 5 years. It has an average risk and high return. The top 3 stocks in its portfolio are CNO Financial Group In, Ensco Plc Class A, and CA Inc. The top 2 equity sectors are financial services, and technology. Crawford Dividend Opportunity Fund uses its assets to buy common stocks of small capitalization companies that demonstrate a consistent pattern of earnings and dividend growth. The fund managers are David B. Crawford and John H. Crawford. The current fund’s yield is 0.84%. 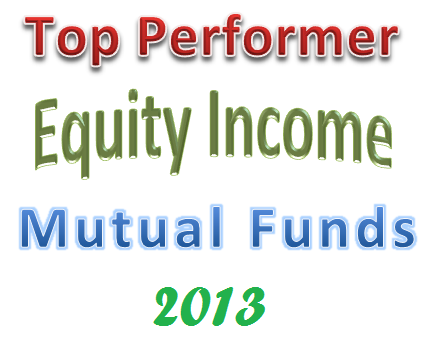 You can buy this top performing equity income mutual fund with $10,000 initial investment. In 2013, it managed to return 37.53%. It is introduced to investors in September 2012. The top 3 equities in its assets are Littelfuse Inc, Atrion Corporation, and Broadridge Financial Solutions. 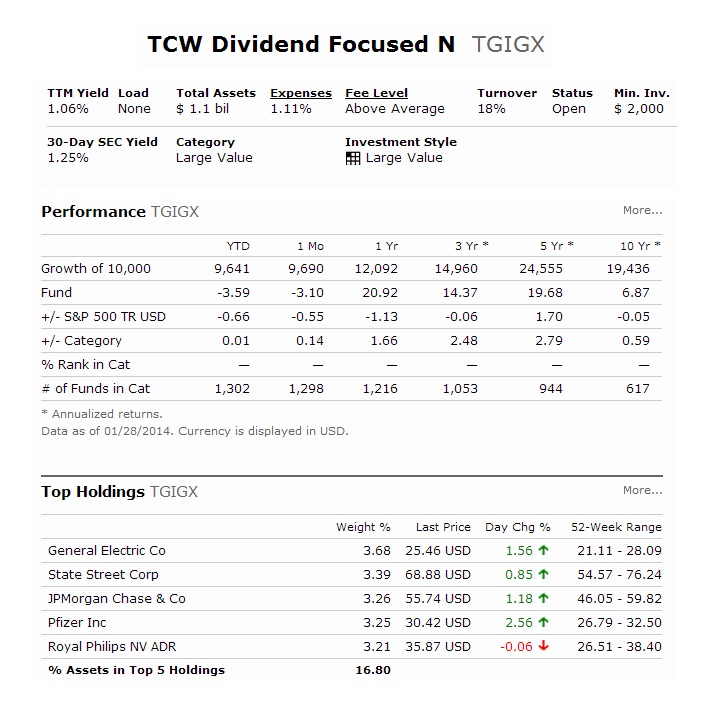 TCW Dividend Focused fund is a popular equity income mutual fund. With total assets of $1.1 billion, it is introduced to investors in September 1986. The fund manager is Diane E. Jaffee since 2001. It has a dividend yield of 1.06%. This no load fund has an expense ratio of 1.11%. You can buy this best performing equity income mutual fund with $2,000 initial investment for your brokerage account, or $500 initial investment for your individual retirement account (IRA). For 401k plan, please check with your fund’s administrator. As of December 2013, the top 2 stocks are General Electric Co, and Pfizer Inc. The top 2 sectors are financial services, and technology. In 2013, it has a year-to-date return of 34.96%. The average 5 years return is 19.26%.